I'm not talking about yoga or your physical flexibility. ​How flexible are you in terms of examining the results of your behavior and deciding maybe it's time to try something new? ​It's so easy to fall into the trap of thinking that nothing can or will change. But we can change! Forty percent of our daily activities are based in habit--things we do without thinking.​ How's that working out for you? ​Only 7% of people are flourishing, that is, doing well in all five areas. Sixty-six percent are languishing, doing well in one area. Yikes! That's terrifying. It's definitely time for us to try some new things to find greater satisfaction in all areas of our lives. In addition to inspiring flexibility and resilience at work, Sherrie ​is also fostering those traits in her mule, Daisy, who is gradually learning to shape her world through deliberate choices as well. Daisy thinks it's difficult, but worth it. What do you think? ​​What are your best tips for stretching your comfort zone and trying something new? 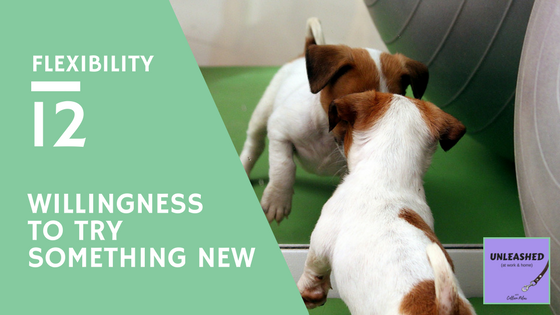 How do you think being flexible is an asset in an animal hospital or other animal-care workplace?